The expansion of the Africa Cup of Nations should see more unfancied teams sneaking into Africa’s premier competition. Mauritania, like Madagascar in the last round of fixtures, could qualify for their first ever AFCON. 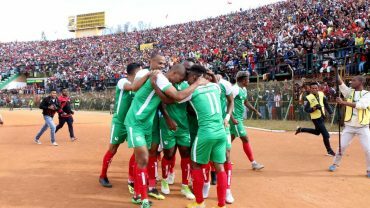 A win against an eliminated Botswana should do it, and even a draw could be enough if the result in the Angola-Burkina Faso clash goes their way.A win for Burundi in South Sudan could also put them in a good position to qualify with Gabon and Mali going head-to-head. Elsewhere, Nigeria will visit South Africa to avenge for their opening group match defeat while Ghana take a trip to Ethiopia. In Group G there’s a do-or-die Congo ‘clasico’ between the Republic of Congo and DR Congo. With Zimbabwe topping the group, a defeat for either side will leave them in a perilous position. Algeria face a tricky away trip to Claude Le Roy’s Togo after losing to Benin while the winner of Namibia versus Guinea-Bissau should all but qualify. Can Tanzania banish away day demons? “If Lesotho beat us it will be a massive shame,” said Tanzania president John Pombe Magufuli. “I will regret coming to address you.” Tanzania’s commander-in-chief was in typically tough-talking form when he addressed some members of the squad after their win over Cape Verde last month gave them some hope of qualifying for AFCON. Like the prototypical African uncle, he bemoaned how they fail time and time again, how Tanzanians spend more time talking about foreign football rather than local, and how the national team can change all that by qualifying for tournaments…and winning them. A win for Tanzania and a Uganda win over Cape Verde in Kampala will see the Taifa Stars qualify for AFCON for the first time since 1982, There’s a big task ahead, though. While their home record has improved enormously in recent years, their fragility on the road has often led to their downfall. To make things that little bit harder, they’ll have to record a positive result without their suspended captain and in-form Mbwana Samatta. He was excellent in the win over Cape Verde. Coach Emmanuel Amunike pleaded for extra resources to make his job easier which the President was happy to release as long as they were not wasted. A pre-game training camp in Bloemfontein has been one of the investments and it will have to produce the desired results otherwise it could be the last penny Amunike and his team see from the Tanzanian government. Cameroon’s clash with Morocco on Friday night presents an opportunity for Clarence Seedorf to check the status of his side in the lead up to the AFCON tournament next summer. Already guaranteed a spot as hosts, Cameroon are unlikely to face a better African side in an environment that would replicate tournament conditions. The downside of hosting and being guaranteed a qualifying spot is there is little in the way of intensive, competitive football when it comes to qualifying. Outside qualification, the rest of their friendlies will be light-hearted affairs, particularly the pre-tournament warm-ups. In Herve Renard’s side Cameroon will be facing arguably the continent’s best side and one of the strong contenders to win AFCON 2019. in the cauldron of Casablanca, Seedorf will get the chance to compare his team against what should be, even minus recent form, one of their rivals for the trophy. Last weekend Tunisian side Esperance sealed a remarkable African Champions League triumph in a hotly contested two-legged affair against Egyptian giants Al Ahly. In Alexandria, the scene of the first leg between Esperance and Al Ahly, they will look to reignite what has become arguably one of Africa’s biggest club rivalry with the taunting, scandals and narratives to match. Javier Aguirre’s Egypt has been the free-flowing antidote to Hector Cuper’s one. But for all their rebranding, they have yet to come up against a side of Tunisia’s calibre under the Mexican’s watch. Their North African rivals inflicted a 1-0 defeat on them last year in the group opener for this qualification phase. While both sides haven’t put a foot wrong since then, as exemplified by the fact both of them having already booked their tickets to next summer’s tournament, this is still a match they won’t be taking lightly.